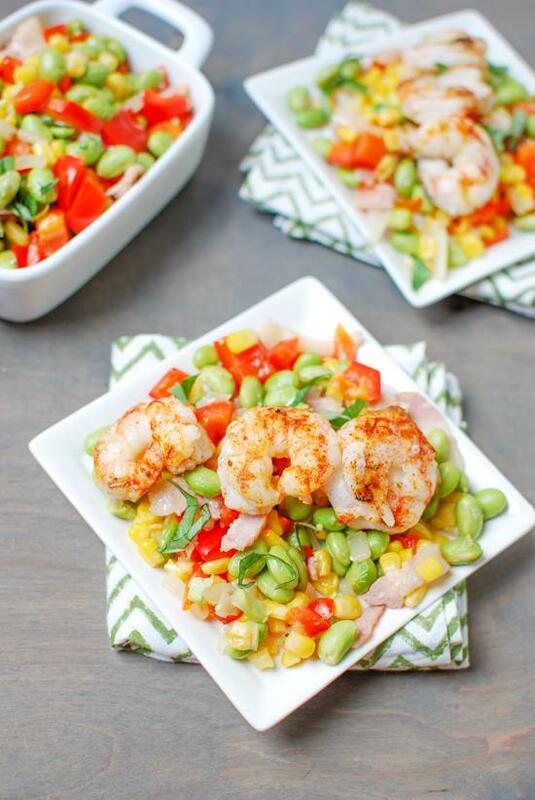 Bursting with summer flavors, this Shrimp and Edamame Succotash is a fun twist on the traditional and makes the perfect weeknight dinner. When I was in school, I spent a year working a few nights a week at a retirement home. All my residents had their favorite meals but one side dish that everyone seemed to love, no matter what their dietary preferences were, was succotash. If I’m being honest, I’ve probably only eaten succotash once in my entire life. It’s traditionally made with lima beans, which are not my favorite, and it just wasn’t something we ate a lot of growing up. As summer rolls around, I’m on a mission to clear some space in my freezer so that I have room for important things like Healthy Ice Cream Sandwiches, Freezer PB Cups and lots of fresh summer fruits and veggies that I can freeze for winter! Last week, while taking stock of what’s currently in the freezer, I came upon a back of frozen edamame. I honestly can’t even tell you how long it had been in there but I decided it needed to be used. It just so happens that shelled edamame looks a lot liked lima beans and the package happened to be sitting next to a bag of corn. Seeing those two together immediately made me think of the succotash I served at the retirement home. I decided to play around with that idea and try to make a quick summer meal that the hubby and I would enjoy. Whenever I think quick, I think shrimp because they’re literally ready in just a few minutes. I decided grilled shrimp would be the perfect addition to this dish to keep it light and fresh. Bursting with summer flavors, this Shrimp and Edamame Succatash is a fun twist on the traditional and makes the perfect weeknight dinner. Cook edamame according to package directions. Add to pan along with corn and cook 3 minutes more. Place shrimp on skewers, brush with melted butter and sprinkle with paprika. Grill 2 minutes per side. If you don’t want to grill your shrimp you can easily cook them in the pan. [br]Feel free to sub your favorite bean for the edamame. This meal comes together really quickly. I grilled my shrimp, or rather hubby did, but you can easily cook them in the pan if you don’t feel like grilling! Don’t like edamame? Use lima beans another bean you enjoy. Feel free to add fresh tomatoes, squash or other summer veggies if you want! 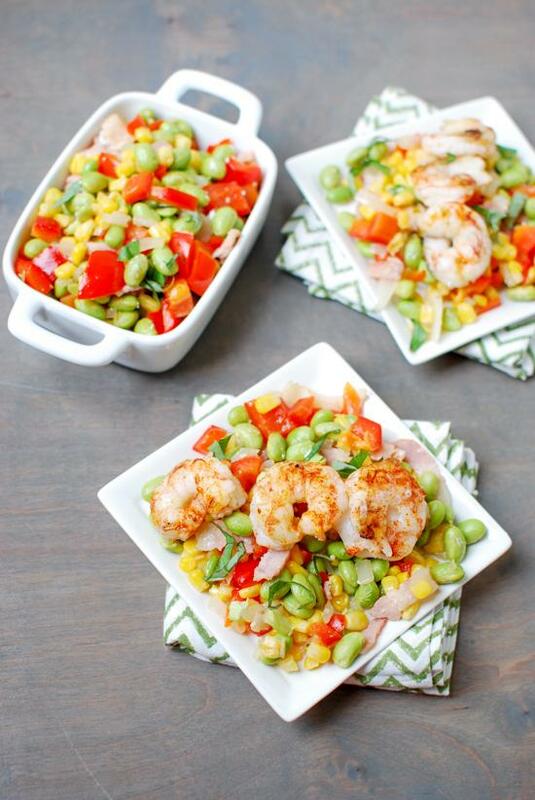 Try this Shrimp and Edamame Succotash from @leangrnbeanblog for a quick weeknight dinner! I never have been a fan of succotash for the same reason – lima beans. Meh. But edamame? I can get behind that. Yum! LOVE edamame and just bought two bags of frozen shelled edamame, may just try this out!!! this really looks perfect for summer! This sounds amazing and I love how colorful it is! This looks AMAZING. It looked good just looking at it but when I saw bacon and goat cheese?! Umm, yes please. I will be making this asap!! I always call lima beans the “poor mans” edamame, haha! Love the addition of shrimp. Can’t go wrong with that! 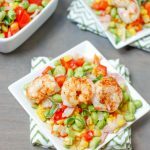 I love shrimp and succotash so this combo is perfect. Yum! Great idea to add shrimp to succotash! This succotash looks and sounds great! The perfect little light meal for summer & I love that you used edamame beans – I don’t think they get used enough in cooking.